Let’s do the math together. AVENGERS: INFINITY WAR is 152 minutes long and features almost everyone in the MARVEL Cinematic Universe. That’s about 33 characters, which means that each one has on average less than five minutes of screen time. If that sounds like the makings for a dog’s breakfast, you might be right… that is, if you’re not a fan of this franchise. But if you are, then you’ll love this film no matter what I say and you might as well stop reading this review now because you’re not going to like it. When we last visited this franchise, we were in Wakanda with the Black Panther and loving its ultra-high tech and cool vibe. At the end of that film, we saw that Bucky Barnes was there recuperating after the civil war between the Avengers. Before that, we were in New York with Spider-man and Tony Stark was telling young Peter Parker to go back to being a friendly, neighbourhood web slinger. Before that, we were with Thor, who had seen Asgard destroyed and had lost both his Mjolnir (hammer) and an eye in the process. In that film’s post-credit scene, Thanos was hot on Thor and Loki’s trail in search of one of the infinity stones that would bring him immense power. And before that, we were grooving to the ’70s music on Peter Quill‘s mixed tape. Gamora had found her sister, Nebula, and was trying to rebuild that fractured relationship, and baby Groot was entering adolescence. Now it doesn’t really matter if you haven’t seen any or all of these other films but it certainly doesn’t hurt if you want to understand what’s going on in this one. Because the story here covers so much ground, there is no time for character development. You’re supposed to know who everyone is and what their motivations are. Blink and you’ll miss a few familiar faces. 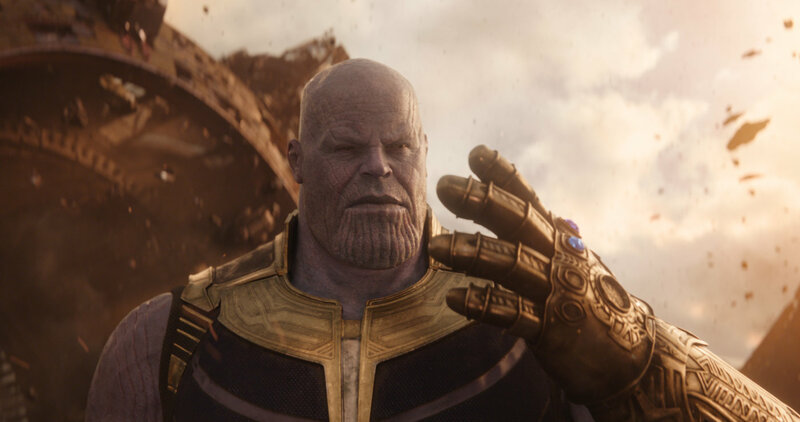 Quite simply, Thanos (Josh Brolin), as we’ve known for a while now, is on a quest throughout the galaxy to find the six infinity stones that will fit on his gauntlet. He’s already got two and, as the film opens, he’s “convincing” Thor (Chris Hemsworth) and Loki (Tom Hiddleston) to turn over the one that’s in their possession. Dr. Strange (Benedict Cumberbatch) has the fourth one, and Gamora (Zoe Saldana), who, you’ll remember, is his daughter, knows where the fifth one is. And the sixth one just happens to be in Wakanda. Now the MCU heroes have to put aside all their old beefs with each other to band together to stop Thanos before it’s too late. My biggest gripe with the MCU franchise is that the films are too long and AVENGERS: INFINITY WAR is no different in that regard. Not only did the film’s writers have to deal with Thanos trying to get the stones and ensuring that all the stars each had their four minutes and thirty-seven seconds of screen time, they also had to tie up more than a few leftover loose ends in the narrative. For example, we knew that Bucky Barnes (Sebastian Stan) lost his arm in AVENGERS: CIVIL WAR. Now that he’s on Wakanda, we can assume that Shuri (Letitia Wright) is going to make him a new and better one. We also know that Captain America (Chris Evans) had lost his shield. Is Tony Stark (Robert Downey Jr.) going to make him a new one as a gesture of reconciliation? Adding all these subplots in, you have one long, bloated film. Fortunately, the story also has a generous dose of humour courtesy of the Guardians of the Galaxy team, Thor and Iron Man. (Bruce Banner (Mark Ruffalo) tries his hand at getting some laughs but he falls short most of the time.) If it weren’t for these characters, this film would be completely dark, which may not have been a bad thing. THE EMPIRE STRIKES BACK was a dark film and most people (myself included) would say that it’s their favourite STAR WARS film. Dark or otherwise, this film manages to undo all the good that was created in BLACK PANTHER. Now T’Challa (Chadwick Boseman) needs a white saviour to protect his nation and people. That was a huge mistake on the part of the writers! Somehow, the film is not the disaster that it could have been, so kudos to the Russo brothers for holding it all together. It’s just slightly better than average though. It’s definitely not as good as BLACK PANTHER or THOR: RAGNAROK but it is better than AVENGERS: AGE OF ULTRON. Fanboys and fangirls won’t care though. They’ll still see it more than twice and the film will still go on to make three-quarters of a billion dollars. I saw the film in IMAX 3D and, once again, I was less than impressed because the glasses darken all the colours. There’s nothing appearing to fly off the screen that would benefit from having 3D and it doesn’t add enough to the experience to warrant the additional expense. As for the IMAX, certainly, if it’s available where you live, see it in that format. The bigger the screen, the better. Watch the review recorded on Facebook Live in RTHK Radio 4’s studio on Thursday, April 26th at 8:30 am HK time! Bummer that you didn’t like it, I’m not even a fan of most MCU movies and I absolutely LOVED “Infinity War.” I do agree with your comment about Ruffalo, his delivery seemed ‘off’ half the time and he just wasn’t funny. Thanks for commenting. I didn’t dislike it. It’s just not my genre of film. If I had to score it out of ten, I’d give it a 6-1/2. I think I would have preferred the director to have split this story into two parts, which would have resulted in a trilogy. It still could have been 2-1/2 hours long, if that’s the MARVEL directive, but there could have been some character development.